Using a depth finder is a simple trick to help an angler catch more fish. Most anglers know that most panfish like to stay on the bottom of the lake, so that is where they will try to place their bait. Instead of using a depth finder, they will lower their bait down in the water and wait for the line to kink up. When they see this action, they will assume that their bait is on the bottom. This is not always the case. When I first started fishing, this is how I did it. This process works okay if the angler is using a heavy jig. However, when fishing for panfish, most successful anglers use small teardrops. Most panfish, especially bluegill, will only bite the smallest offering. When using the line kink method with small jigs, the jig will sometimes hit the bottom of the lake or pond and keep sliding along or sink into the dirt. The angler will keep pulling line out, thinking the jig is still not to the bottom. 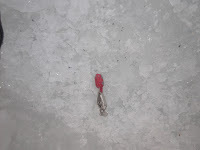 The line will eventually kink up, but the bait will be buried into the floor of the lake or pond. This used to happen to me all of the time. I never seemed to have any luck fishing until my father-in-law showed me how to use a depth finder. The process of using a depth finder is really simple. First, the angler simply hooks the depth finder on to the bait. The bait is then lowered down until the angler can feel it hit bottom. The angler then pulls up the line, takes the lure off, and then drops it back down to start fishing. When putting the depth finder on your bait, make sure it is secured properly. If it is not, the depth finder will turn into structure at the bottom of the water.